Even one week against one of the five least talented teams of Div. I football, FBS and FCS combined, can reveal obvious traits about a squad coming off an 0-12 season. For Kansas, which ended a 15-game losing streak with a 55-6 thrashing of Rhode Island, two factors leaped off the replay: 1. 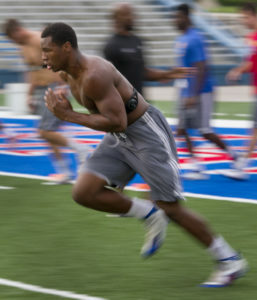 The Jayhawks, as suspected, have far more speed than a year ago. 2. The offensive line — still too young, too at a disadvantage because of not having as many combined years in a college weight room as most college blockers — will have trouble getting much push for runs up the middle. In contrast, Ohio has a ton of experience up front on both sides of the ball. 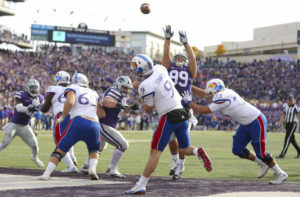 Kansas has talent at defensive line, so matching the Bobcats’ massive O-line is a possibility. The other matchup doesn’t figure to go as well for Kansas, with Ohio’s experienced D-line having the big strength edge. 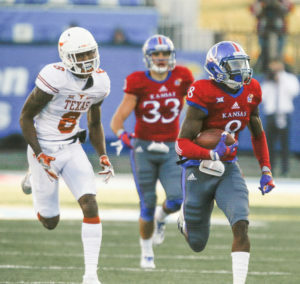 So Kansas will need to turn speed and creativity into big plays Saturday in order to emerge with its first two-game winning streak since two weeks into the 2011 season. 1 – LaQuvionte Gonzalez: He consistently used his speed and quickness to get open and looked like a threat to pop one nearly every time he touched it as a kick and punt returner. By reaching around the defensive back and somehow coming away with the ball for a touchdown, Gonzalez provided a highlight that figures to be shown for years, maybe forever. The defense must account for him at all times and still he finds ways to get open. 2 – Montell Cozart: Sure, it wasn’t his first big day against FCS competition, but Cozart looked so much more decisive, more accurate and even looked as if he has strengthened his arm. 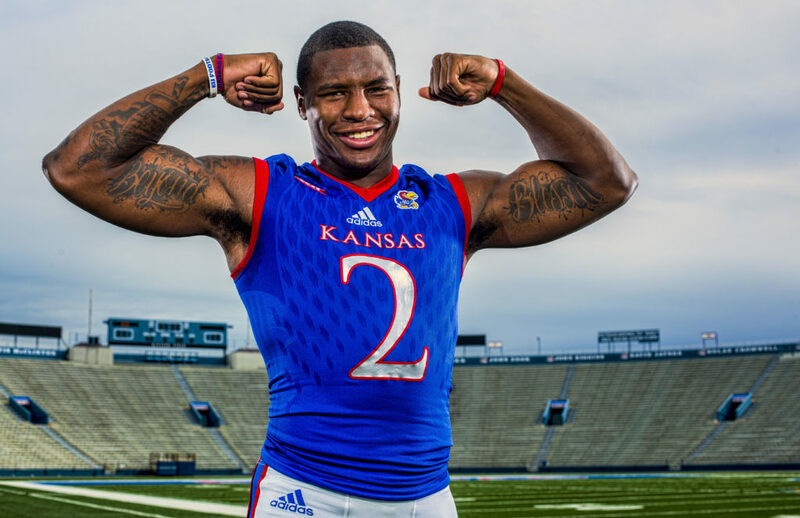 David Beaty’s version of the Air Raid offense just might suit Cozart ideally. An easy man for whom to root because of his thick skin and positive personality, Cozart has the potential to make Beaty look wise for resisting the temptation to turn him into a wide receiver. 3 – Taylor Martin: He and Gonzalez are the two fastest players on the team. That speed makes Martin a threat running on the edge and getting behind the defense on pass patterns. Cozart barely overthrew him on a long pass down the sideline or he might have gone … all … the … way. 4 – Dorance Armstrong: I had forgotten that Armstrong changed to No. 2 for his sophomore season and on one of the first plays of the replay I watched on ESPN3, I wondered who that player flying toward the sideline was, figuring he must be a safety. He’s a defensive end and he plays with equal parts speed and intensity. 5 – Daniel Wise: Emerged as a team leader during offseason conditioning and looked like a man on a search-and-destroy-the-quarterback mission in the opener. He has the potential to deliver a strip-sack at a pivotal point in the game. The D-tackle’s most important work will come in doing his job against the run. 6 – Kyle Mayberry: The true freshman cornerback from Tulsa did not have the uncertain, shaky look so common among athletes competing in a college game for the first time. He’s blurry fast, seems to love the spotlight and has the sort of confidence that could enable him to take a chance and deliver a pick six. 7 – Beaty, the offensive coordinator: Again, it helped that Rhode Island was the opponent, but Beaty certainly seemed to have a winning touch for what play to call when. The Rams’ defensive line was pushing back the Kansas blockers — not a good sign — and getting more aggressive by the play. So Beaty called a play that baited that aggressiveness and resulted in tight end Ben Johnson standing alone in the end zone for an easy touchdown reception from Cozart. Not all football games are won and lost in the trenches. 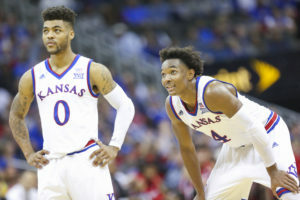 Sometimes they are won with big plays, which very likely will be what Kansas needs if it is going to defeat Ohio.